Family vacations are the most intriguing time. We often crib before planning for vacation with friends and neighbours. One of the favorite destination for family vacation in India is Shimla. 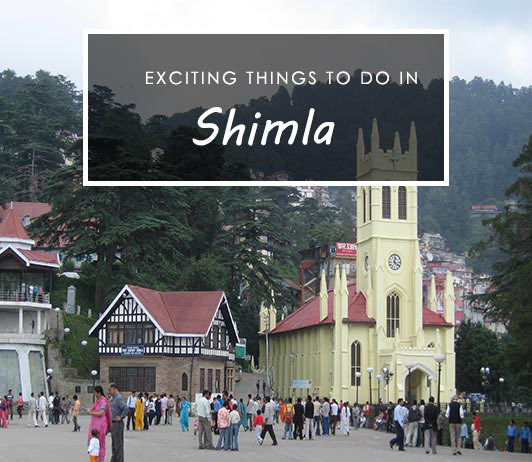 Here is a list of things that you can do on a family vacation in Shimla. This experience is totally unmissable. The toy train runs between Kalka and Shimla. The toy train runs in between the mountains and tunnels that give a feeling of the fairy tale. You can pass through beautiful stations such as Dharampur, Solan and Barog. You must explore short trekking. Some of the famous places are Kanma Dev temple, Dhanudevta temples, Tata devi temples, jakhoo temples and Chadwik falls. You can do this trekking with your family. There are many colonial architectures and buildings in Shimla that are worth visiting. You can visit many places such as amphitheatre, city museum, conference hall and multipurpose theatre. It is a wood market in Shimla. It is well-known for its decorative articles and walking sticks. It is an ideal place to go shopping with your family members. This place has all wooden items starting from home décor items to wooden key ring. Kufri is around 16 Kms away from Shimla. It has a scenic landscape with yak ride. Yaks are very few in India, so this is a whole new experience to try something different on your family vacation. Visiting Jakhu temple is a worth. It is located on a hill at the 2455 meter above the sea level. It is a Hanuman temple that offers a spectacular view of Sanjauli town and Shavalik hills. Fairs are an important part of tradition and culture. There are many fairs in the city and are the best way to increase your holiday experience. There are many events like summer festival, Lavi fair, Rohru fair, MahasuJattar, Halog, winter sports festival, Bharara fair and Sipi fair. Visiting these fairs prove beneficial that will add knowledge and understanding of a culture. You can enjoy ice skating in winter. It has open air ice skating. The season of ice skating is between December and February. The visit to Vice regal lodge is very essential. It is a magnificent building and was a residence of the British viceroy Lord Dufferin. It is a six story monument and is surrounded by gardens. It’s now been converted to Institute of Advances Study and state museum. You can enjoy ambience by visiting Ridge in Shimla. It is often crowded and connects to the mall. You can also visit St. John’s Church. Shimla is a capital of Himachal Pradesh and a popular hill resort. It is on the top list of many people as it has easy accessibility, perfect climate, attractive tourist spots and excellent infrastructure. Hello to every , as I am actually keen of reading this blog’s post to be updated daily.